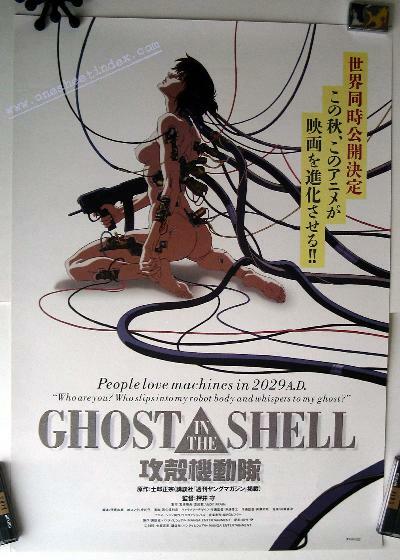 Kokaku Kidotai (released in the U.S. as Ghost in the Shell), the 1995 Mamoru Oshi Japanese animated cartoon anime science fiction futuristic fantasy action thriller with tagline "People love machines in 2029 A.D."; "Who are you? Who slips into my robot body and whispers to my ghost?" Starring the voices of Atsuko Tanaka, Akio Otsuka, Tamio Oki, Iemasa Kayumi, and Koichi Yamadera and the English version featuring the voices of Richard Epcar, William Frederick, Christopher Joyce, Abe Lasser, Namaki Masakazu, Mitsuru Miyamoto, Simon Prescott, and Mimi Woods and features Hiroyuki Okiura (illustration)/Teruhisa Tajima (design) artwork.